Enrich Gifts: Ghee whiz. Butter isn't bad. Even with the backlash against margarine and other spreads that come from factories, not from cows, a lot of people are still suspicious of all-natural butter. But the truth about butter – and especially a very specific kind of butter – is really quite different. Butter has been used as a staple food for thousands of years. And, clarified butter (known by the kind of weird word 'ghee' [pronounced "gee" as in "gee whiz"] in India where it got its origins) has been prized for its health benefits for millennia. But as America began expanding around the waistline and as heart disease rates exploded in the 1960s and 70s, fat and cholesterol in our diet got most of the blame. Butter is basically pure fat. 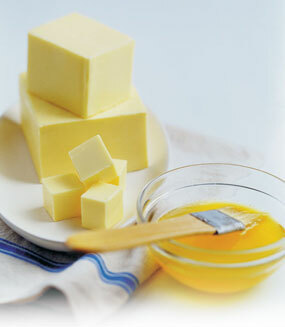 A tablespoon of butter contains 14 grams of fat, including 8 grams of saturated fat. It also has 30 mg of cholesterol. So, under the thought that fats, and particularly saturated fats, are bad for you, butter became a taboo food for many. What people didn't realize was that while heart disease had been going up, butter consumption had been on the decline – people had been trading it in for margarine. With the low-fat diet craze, butter consumption fell even further, and the use of processed spreads like margarine rose even more. Heart disease, diabetes, and obesity continued to climb right along with our intake of processed foods. Only recently have nutritionists and medical scientists come to realize that your body needs fat – even saturated fat. That means you can enjoy real butter – the great taste, the versatility – and get some great health benefits, too. Butter can play an important and healthful role in your diet as long as you follow a few simple guidelines. The best kind of butter to use is clarified butter, often called by its Indian name, ghee. Ghee is made by melting butter over low heat to remove much of the moisture. The melted mixture is then strained to remove caramelized milk solids. You're left with a pure, rich buttery substance that is excellent for cooking. And it's good for you! Consuming purified butter like ghee delivers vitamin A, which is essential for good adrenal health; lecithin, which helps your body metabolize cholesterol; antioxidants like vitamin E and selenium; and conjugated linoleic acid, which promotes a strong immune system. Foods like ghee can promote proper hormone balance, good heart health, and better energy levels. The main difference between ghee and straight butter is that the impurities have been removed from ghee. You get all the health benefits without the drawbacks. Despite being a high-fat food, ghee offers a number of health benefits when you use it in moderation. Two tablespoons or less of ghee a day can help to lower your risk of cardiovascular disease, especially if the balance of fats in your diet comes from plant sources – a fact that hasn't been confirmed about regular butter. Fats like butter and ghee are made of fatty acids, which get categorized as short-chain, medium-chain, and long-chain. Stick with me – I'll show you why this matters. Long-chain fatty acids tend to be the most damaging to your heart health. Compared with butter, ghee contains a higher percentage of short- and medium-chain fatty acids and a lower percentage of long-chain fatty acids, making it more beneficial for your health. Ghee also has one of the highest smoke points that you'll find in a fat, making it ideal for cooking. Many fats begin smoking below 400 degrees, but ghee's smoke point can be as high as 500 degrees. When an oil or fat reaches its smoke point, heat damage occurs, and that can trigger the production of compounds that, when you eat the food, will increase the level of free radicals in your body. By cooking with ghee, you make healthier food that is less likely to cause the kind of free radical damage associated with premature aging. In Ayurvedic medicine, ghee is prescribed for people with joint stiffness and chronic pain. Ghee helps to lubricate connective tissues, which can relieve pain and promote flexibility. Traditionally, ghee is prepared in India according to their own customs. But as word has gotten out about the amazing health benefits of ghee, about its versatility in cooking, and about its rich, pure flavor, it's grown in popularity. Many companies around the world now produce and offer ghee, so you have a lot of options. You can find ghee at your local health food store or you can even buy high-quality butter and make you own. However you get it, ghee is definitely worth adding to your daily diet. It's a food that truly is good and good for you.